the Battle of Vienna (1683) during the Great Turkish War. Painting by Józef Brandt. The Great Turkish War refers to a series of conflicts between the Ottoman Empire and contemporary European powers, then joined into a Holy League, during the second half of the seventeenth century. It marked the end of the Ottoman incursion into Europe and the start of Ottoman territorial retreat. Austria gained most of Hungary, Transylvania, and Slavonia, Poland recovered Podolia, and Republic of Venice also gained territory, some of which was later returned to Turkey. Despite some territorial recovery in the eighteenth century, such as Azov from Russia between 1711 and 1774 and the Peloponnesus peninsula in 1718, the following century saw further losses starting with Greece in 1829, then by successive Balkan provinces through until the end of the century. A succession of weak Sultans, financial indebtedness to the great powers and failure to modernize the army, once innovative and technologically superior to European forces, all contributed to the empire's stagnation and decline. The self-consciously Christian identity of the European allies and the explicitly Muslim identity of the Ottoman Empire represents for some a class of religions, of cultures and of civilizations. Some see the subsequent decline and fall of the Ottomans in terms of a Christian victory, or as the triumph of freedom loving Europe over and against a totalitarian imperial system that lacked respect for the dignity of all people. On the other hand, historically, the Ottomans did treat minorities well, and many people in the empire enjoyed peace and security for lengthy periods, so aspects of the Ottoman legacy should not be undervalued. This war, like that of all the epochal confrontations that took place between the European and Ottoman spaces, tends to be told in a way that suggests constant hostility and civilizational clash. This is almost inevitable when the narrative being told is one of war, rather than about what life was like for people in the region of conflict during periods, sometimes lengthy, between battles. Some people in the frontier zone actually did find ways to co-exist in harmony, which is the "other side" of the narrative of war. As people in more and more contexts experience the reality of cultural and religious pluralism, the "other side" of the story of such conflicts as the Great Turkish War, even if periods of hostility did outweigh those of harmony, may be of greater moral relevance in today's world. After the Cossack rebellion led by Bohdan Khmelnytsky of 1648-1654, against Poland-Lithuania, when Russia acquired parts of Eastern Ukraine from the Polish-Lithuanian Commonwealth, some cossacks stayed in the southeast of the Commonwealth. Their leader, Petro Doroshenko, signed a pact with the Ottoman Empire, in 1666, which preserved his leadership but under Ottoman suzerainty. The Christian Cossacks were profoundly unhappy with this and the unrest that followed presented Jan Sobieski, then army commander, an opportunity to invade. In 1672, the Sultan Mehmed IV, who knew that the Polish-Lithuanian Commonwealth was weak due to internal conflicts and action in the Ukraine, attacked Kamieniec Podolski, a large city on the border massing 80,000 troops. Sobieski won some minor skirmishes but his much smaller army was defeated by the larger Ottoman one in what is sometimes known as the Polish-Ottoman War (1672–1676). The first battle took place in Sconograd, Hungary, which was occupied by the Ottomans. The Polish army was defeated. The Poles retreated after three months. The Poles tried to defeat the Ottomans for four years, with no success. The Turkish advance followed later to the beginning of the Russo-Turkish Wars. The Poles agreed to surrender Kamieniec Podolski and the adjacent region and to pay tribute to the Ottoman Sultan in the Peace of Buczacz. When a message about the defeat and treaty terms reached Warsaw, the Sejm (Commonwealth parliament]] refused to pay the tribute. Accordingly the Sejm organized a large army under Jan Sobieski, who won a battle near Chocim, in 1673, without however regaining Kamieniec Podolski. After King Michael’s death in 1673, Jan Sobieski was elected king of Poland. After a few years of peace, the Ottoman Empire attacked the Habsburg Empire. The Turks almost captured Vienna, but John III Sobieski led a Christian alliance that defeated them in the Battle of Vienna which stalled the Ottoman Empire's hegemony in south-eastern Europe. The capture of the city of Vienna had long been a strategic aspiration of the Ottoman Empire, due to its inter-locking control over Danubean (Black Sea-to-Western Europe) southern Europe, and the overland (Eastern Mediterranean-to-Germany) trade routes. During the years preceding the second siege (the first one was in 1529), under the auspices of grand viziers from the influential Köprülü family, the Ottoman Empire undertook extensive logistical preparations this time, including the repair and establishment of roads and bridges leading into Austria and logistical centers, as well as the forwarding of ammunition, cannon and other resources from all over the Empire to these logistical centers and into the Balkans. The Ottomans laid siege on July 14, 1683, pitting 12,000 Janissaries with another 70,000 in reserve against 11,000 troops, 5,000 citizens and volunteers with 370 cannons manning the city's defenses under Ernst Rüdiger Graf von Starhemberg. The Ottoman siege cut virtually every means of food supply into Vienna, and the garrison and civilian volunteers suffered extreme casualties. Fatigue became such a problem that Graf Ernst Rüdiger von Starhemberg ordered any soldier found asleep on watch to be shot Increasingly desperate, the forces holding Vienna were on their last legs when in August, Imperial forces under Charles V, Duke of Lorraine beat Imre Thököly of Hungary at Bisamberg, 5 km northeast of Vienna. Relief numbering 84, 450 soldiers provided by Poland-Lithuania arrived on September 12, and the Battle of Vienna took place outside the city. The Ottomans attacked early, hoping to interfere with the deployment of the League's troops. However, this ploy failed and after twelve hours of fighting, the Poles held the high ground on the right. The Holy League cavalry waited on the hills, and watched the infantry battle for the whole day. Then at about 5 p.m., the cavalry attacked in four groups. One group was Austrian-German, and the other three were Polish. Over 20,000 men, charged down the hills (one of the largest cavalry charges in history). The charge was led by Sobieski at the head of 3,000 Polish heavy lancers, the famed "Winged Hussars." 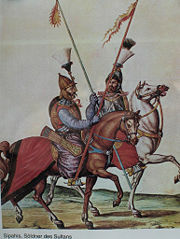 The Lipka Tatars who fought on the Polish side wore a sprig of straw in their helmets to distinguish themselves from the Tatars fighting on the Turkish side. The charge broke the lines of the Ottomans, who were tired from the long fight on two sides. In the confusion, the cavalry headed straight for the Ottoman camps, while the remaining Vienna garrison sallied out of its defenses and joined in the assault. The Ottoman troops were tired and dispirited following the failure of both the sapping attempt and the brute force assault on the city. The arrival of the cavalry turned the tide of battle against them, sending them into retreat to the south and east. In less than three hours after the cavalry attack, the Christian forces had won the battle and saved Vienna. After the battle, Sobieski paraphrased Julius Caesar's famous quote by saying "Venimus, Vidimus, Deus vicit" - "We came, We saw, God conquered." A new Holy League was initiated by Pope Innocent XI and encompassed the Holy Roman Empire (headed by Habsburg Austria), the Venetian Republic and Poland in 1684, joined by Muscovite Russia in 1686. The second Battle of Mohács was a crushing defeat for the Sultan. Russia's involvement marked the first time the country formally joined an alliance of European powers. This was the beginning of a series of Russo-Turkish Wars, which continued into the twentieth century. As a result of the Crimean campaigns (1687 and 1688) and Azov campaigns (1695-1696), Russia's Peter the Great captured the key Ottoman fortress of Azov. It was handed back to the Ottoman Empire in 1711, then returned to Russia by treaty in 1774. 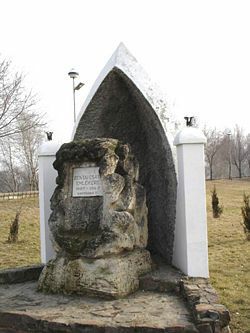 The monument of the battle. The turning point in the war was the Battle of Zenta, which took place in 1699. Prince Eugene was made commander in chief of the Army in the Kingdom of Hungary on July 5, 1697. His army consisted out of 70,000 men at full strength of which only 35,000 were battle ready. As the war chest was empty, Eugene had to borrow money in order to pay wages and to create a working medical service. When news arrived that the Sultan and his army were in Belgrade, Eugene decided to concentrate all his available troops from Upper Hungary and Transylvania and started to move his troops towards Petrovaradin. After the concentration took place, Eugene had an Imperial Army of 50,000 to 55,000 men to face the Ottomans. During August, Eugene offered battle in the neighborhood of the fortress of Petrovaradin but the Ottomans, attempting to start a siege, refused to engage in battle. In September the Ottomans moved north in an attempt to capture the fortress of Szeged and the Imperial army followed. After the capture of Dschaafer Pasha by the imperial cavalry, the plan for siege of Szeged was abandoned and the Sultan decided to return to winter quarters near Timişoara. When Eugene learned of these movements, he decided to force a battle. On September 11, 1697, the Ottoman army was trying to ford the river Tisa (Tisza) near Senta, not knowing that the Imperial Army was nearby. The Imperial army thus was able to effect a complete battlefield surprise and to attack the enemy while he was still in the process of crossing the river. After an intensive artillery bombardment, many Imperial Dragoon regiments dismounted and proceeded to the moat encircling Ottoman camp, exchanging fire with the enemy. Ottoman troops behind the entrenchments retreated in confusion to the bridge, access to which became overcrowded. Austrian artillery decimated and slaughtered the Ottoman troops. The left flank of the Christian army attacked, penetrating between the Ottoman left flank and the bridge, cutting off their retreat. At the same time, Imperial forces attacked from the front and, after ferocious close-quarter fighting, broke through the trenches surrounding the Ottoman camp. Inside the camp, beyond the camp-wagons, the slaughter was terrible. Imperial soldiers pressed the attack relentlessly. Barely a thousand Ottoman soldiers escaped. More than 10,000 Ottoman troops drowned in the Tisa river. Up to 20,000 Ottoman soldiers were slaughtered on the battlefield. The battle was an amazing victory for Austria; at the cost of 500 men they had inflicted the loss of 30,000 men and captured the sultan's harem, 87 cannon, the royal treasure chest and the state seal of the Ottoman Empire. The main Ottoman army was scattered and the Austrians gained complete freedom of action in Bosnia, where Sarajevo was burnt. By the terms of the Treaty of Karlowitz (signed January 26, 1700), the Austrians forced the sultan Mustafa II to make peace with the Emperor, and to cede Transylvania and the Ottoman eyalets of Buda, Eger, and Kanizsa, which were later transformed or integrated into Habsburg provinces known as the Principality of Transylvania, Kingdom of Hungary, Kingdom of Slavonia, and the Military Frontier. Sickler says that defeat at Zenta left the Ottoman territories in Europe "virtually defenseless". The Treaty "for the most part provided that each country retain the territories that they were in control of at the time of cessation of hostilities." Other stipulations were that the Sultan allowed Catholics "freedom of worship" which "gave the Hapsburg emperor the opportunity to intervene in Ottoman affairs, ostensibly on behalf of his coreligionists"
Mehmed IV was partly responsible for the beginning of the decline, even though he won a victory against Poland-Lithuania. He devolved most of the sultan's power to his vizier, an arrangement which continued after he was deposed in 1687. His successor, Suleiman II had no training at all in leadership but appointed a competent vizier. The next sultan, Ahmed II also let his vizier rule, who suffered humiliating defeats at the hands of the Austrians. A succession of sultans followed, none of whom gave the Empire strong or competent leadership. Abdul Hamid II, who ruled from 1876 until he was deposed in 1909, who lived until 1918, saw the final collapse of the empire. He presided over the loss of the Balkans, and entered an alliance with Germany, which resulted in Turkey fighting on the losing side in World War I. It was after the Treaty of Karlowitz that the Ottoman Empire "went into unrelenting decline." No longer on the offensive, it shifted into an offensive posture. The ability of European states to intervene in Ottoman affairs continued as the empire declined and borrowed money from Europe. The first of many "capitulations" was negotiated by France in 1740, which granted them custodianship of Christian sacred sites in the Empire and trading concessions. Based on their commercial interests and "capitulations," the British and French would divide the empire up between themselves during World War I. They were quick to reverse their earlier policy when they saw the prospect of gaining territory to add to their own empires. During the Balkan Wars they had favored the continuation of the Ottoman empire fearing that independent Balkan states, especially a strong and possibly larger Serbia would fall into Russia's sphere of influence. At the Congress of Berlin (June 13-July 13, 1878) the European powers met to deal with what they saw as the Turkish problem. Some territory was returned to the Ottomans but Britain gained Cyprus, Bulgaria gained independence (part of Bulgaria remained within the Ottoman empire) and Bosnia and Herzegovina was placed Austria-Hungarian administration. Europeans have tended to look with glee upon the decline and fall of the Ottoman Empire, sometimes ascribing this to the superiority of European civilization and of the Christian religion over and against a non-European, Muslim imperial system (although Turkey is partly in Europe). On the other hand, from a moral point of view, imperialism whether European or non-European inevitably denies people the right to govern themselves and involves exploitation. Throughout history, empires have risen and fallen and have always expressed a person's or a nation's desire for power, prosperity, and prestige at the expense of another's. The great European empires expanded as a result of the collapse of the Ottomans but later found themselves fighting independence movements and just as the Ottoman's had done at an earlier stage in history. It would be difficult to compare imperial records. It would, however, be equally difficult to claim that the European powers were any less oppressive and exploitative than the Ottomans were. Despite the fact that Europe and the Ottomans clashed for centuries, some of those who lived in the very space where conflict habitually took place developed mutual respect and found ways of living peacefully together when their lives during the periods between hostilities. It has been suggested by O'Shea and others that such zones can serve as bridges instead of buttresses between civilizations and that our collective memories can choose to remember episodes of peaceful co-existence instead of epochal battle after battle, so that we overcome the "selective, agenda-driven amnesia" that distorts historical memory. ↑ Government of Poland, History: Jan III Sobieski. Retrieved August 4, 2008. Barker, Thomas Mack. 1967. Double Eagle and Crescent Vienna's Second Turkish Siege and its Historical Setting. Albany, NY: State University of New York Press. ISBN 9780873951258. Sicker, Martin. 2000. The Islamic World in Ascendancy from the Arab Conquests to the Siege of Vienna. Westport, CT: Praeger. ISBN 9780313001116. Sicker, Martin. 2001. The Islamic World in Decline from the Treaty of Karlowitz to the Disintegration of the Ottoman Empire. Westport, CT: Praeger. ISBN 9780313000959. Stoye, John. 2006. The Siege of Vienna. Edinburgh, UK: Birlinn. ISBN 9781843410379. Türk ve İslâm Eserleri Müzesi. 1999. War and Peace: Ottoman-Polish Relations in the 15th-19th Centuries. İstanbul, TR: Fako İlaçları A.Ş. ISBN 9789751722249. History of "Great Turkish War"
This page was last modified on 28 August 2008, at 17:23.